Commander Ian Anderson is no ordinary retiree living the simple quiet life with his Ipoh-born wife Meng Wai in Ipoh Garden. He is an iconoclast who has single-handedly built up an impressive collection of artifacts, memorabilia, photos, videos, tin mining equipment and a tremendous archive of Heritage and Social History on the worldwide web to leave a precious legacy for future generations of Ipohites. A Scotsman, born in UK a few months before the start of World War II and educated until age 16 at Wimbledon College, Ian had a simple childhood governed by shortages of all kinds, post war restrictions and ration books. He remembers a lot about those days of war and put it simply when he said “No matter how young you are, if terrible things happen they stick in your brain. Forever!” One fun thing he has never forgotten is the celebration for VE (Victory in Europe) Day in May 1945 when at the local street party he won the fancy dress competition dressed as a Chinaman. Could that have been fate taking a hand? At 16, like most of his classmates, he came out into the wide world with a handful of Cambridge ‘O’ Levels and the need to find a future. For in those days only the top 20 per cent or so could go on to University, everybody else had to find a job, join the armed forces, go to a Technical College or take up an apprenticeship. Ian combined two of these choices by joining the Royal Navy as an Artificer Apprentice and emerged 30 years later as a well travelled and experienced Weapons Engineering Commander. Early on in this major journey through life he was based in Singapore as a young man and visited Malaya many times, his first visit to Ipoh being in 1962. Returning to Malaysia several times over the following years he seems to have garnered a special feeling for the country and its people, from which Ipoh and Perak benefit today. 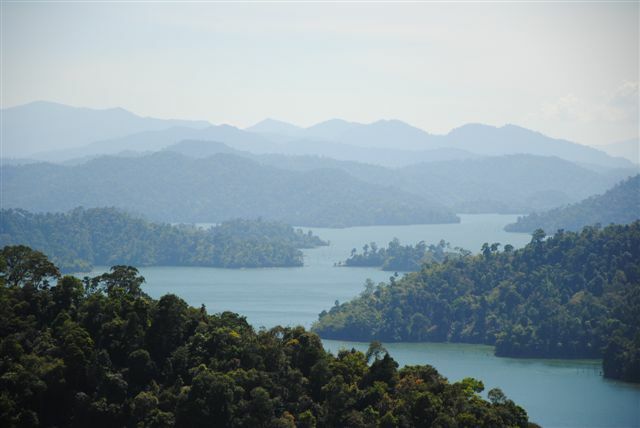 Having left the Navy in 1985 Ian worked as a Project Manager in the shipbuilding industry for some five years and when offered a post in Kuala Lumpur he jumped at the chance to rekindle his relationship with the country. After ten years in KL, where apart from the job he took an active part in local charities and organisations, he retired as Managing Director of the British-based company and decided to stay on in Malaysia where he started his own business in partnership with a local friend. At that stage he decided to move to Ipoh to escape the KL traffic jams and escalating prices of accommodation. Despite being an engineer by profession who hated history at school, since he has been in Ipoh he has developed a keen interest in our heritage and history and he firmly believes that knowledge of the past is vital for future generations. Thus he is the man behind, not only the ipohWorld website and the very unusual book, “Ipoh My Home Town”, but he has also put on several exhibitions featuring local history, the latest being “A Tin Mining Family” in Falim House, his largest show so far. With free entrance this had entertained more than 12,000 visitors both locals and tourists when it closed on August 11 after a three-month run. But he is not sitting back on his laurels even now, for he has the burning ambition to see Ipoh have its own permanent heritage gallery as part of the ipohWorld facilities. “This will provide much-needed entertainment for tourists in parallel with enhancing our students’ knowledge of their roots,” he says. He is hopeful that this will happen soon. Since he moved to Ipoh, Ian, a Permanent Resident, has fully embraced life here, perhaps more so than most of the locals and probably knows his way (shortcuts included) around the city better than most Ipohites! Keeping his finger on the pulse of his adopted home he is often seen traversing around town, with camera in hand. One high-ranking civil servant once had this to say about Ian, “Here is a man who cares more about Malaysia than most Malaysians.” There is no doubt about that! 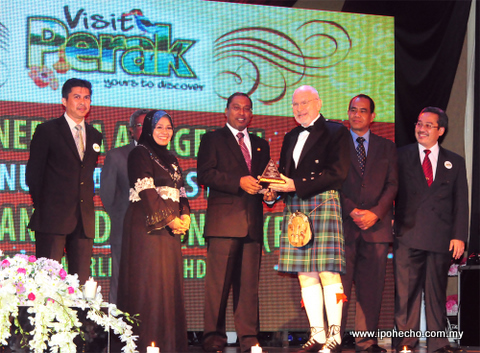 The Perak Tourism Award Night 2011 (Malam Anugerah Pelancongan Negeri Perak 2011), held at the Royal Perak Golf Club on the night of Friday, December 30, was a fitting finale to Year 2011. It was organised with much pomp and fanfare befitting its stature. The organisers left no stones unturned to make it a night to remember. It was an occasion to recognise the contributions of those (entitles and individuals) who had actively participated in promoting Perak to the world. 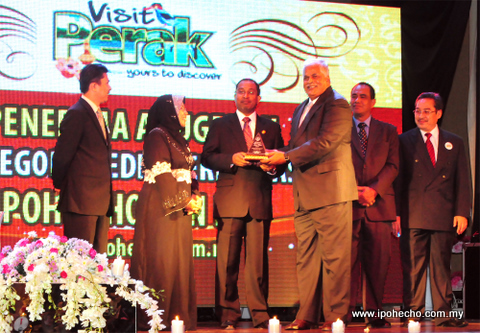 On a lighter side, it was another glitzy prelude to Visit Perak Year 2012. 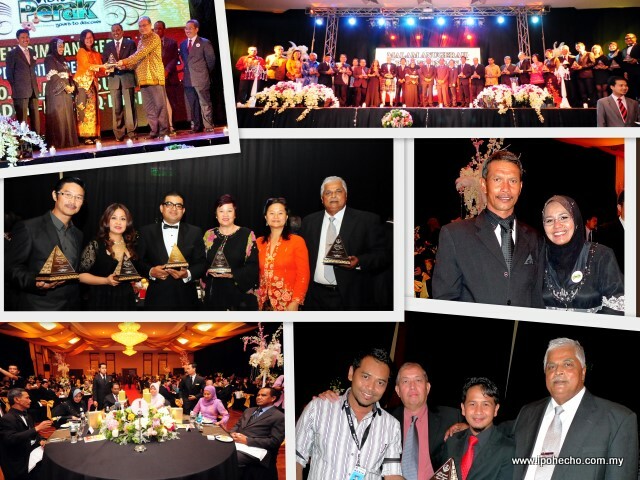 Twenty one awards were presented to 18 entities and four individuals. Ipoh Echo with its more than 1 million online hits a month, was one of them having bagged the Innovative Media Category beating two other nominees for the title. The nomination criteria considered were circulation number, visibility and average monthly online visits and hits. Commander Ian Anderson RN (Rtd), whose blog www.ipohworld.org.my registered an average of 12,500 visits and 290,000 hits per month, was one of the four winners in the Special Award Category (Personality). The other individual winner was Datin Roslina Ooi. Rosalina was recognised for her contributions to the state’s performing arts scene, which were second to none. In the City Hotel Category, Syuen Hotel was adjudged the winner while Banjaran Hotsprings Retreat was declared the best resort. Penangites Khoo Salma Nasution and Abdur-Razzaq Lubis were the surprise winners in the Best Publication Award Category for their numerous books and published materials on Perak. The glittering event was graced by Menteri Besar Perak, Dato’ Seri DiRaja Zambry Abd Kadir, his wife, Datin Seri DiRaja Sharipah, Executive Councillor for Tourism, Dato’ Hamidah Osman and senior state officials. Popular Malay singer Misha Omar and crooner Hazami entertained the 400-odd audience with a lively rendition of their sentimental favourites. Hazami’s haunting “Sonata Musim Salji”, a Malay cover version of the theme song from the Korean drama, “Winter Sonata” captivated the crowd. Music was provided by Universiti Pendidikan Sultan Idris’s Kombo Hi-Sound. Selendang Perak dancers performed an animated routine to usher in the crowd. 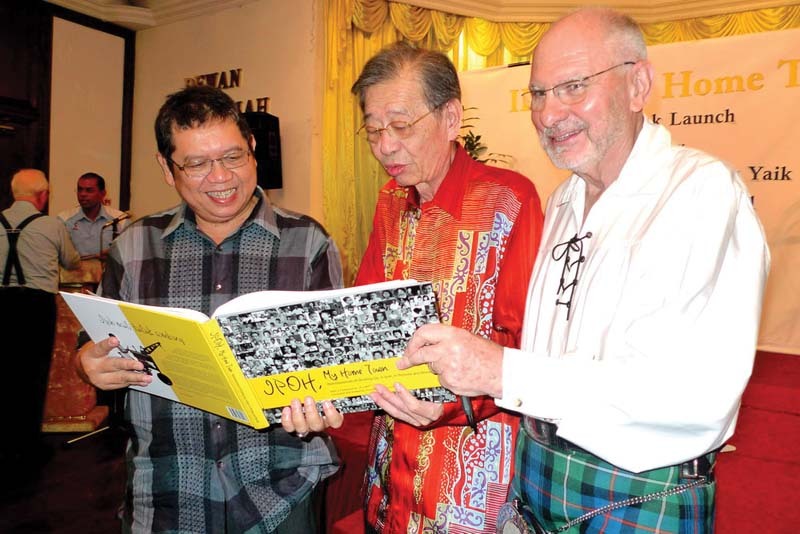 The who’s who of Ipoh gathered at the Royal Ipoh Club on September 17 for the book launch of Ipoh, My Home Town, a 276-page coffee table book compiled by Scottish expatriate Commander Ian Anderson who has lived in the city since 1999. Present for the launch was Tun Dr. Lim Keng Yaik, a former cabinet minister, and Dato’ Mohamad Noor Khalid better known as Lat, cartoonist. In his address Anderson described the book as “unusual” as it had not 1 but 47 authors, while he was just “the editor and compiler of the book”. There are 67 stories in all in which the authors describe their growing up years in Ipoh with a wide spectrum of topics of life from the early to mid 20th century. Dato ‘Lat” contributed a reading from the book about the time when his dad shifted to Sungai Rokam Ipoh and described his experiences as a town boy at the time. But probably it was Tun Dr. Lim who really brought the launch to life when he described his experience of growing up in Ipoh upon being sent to St Michael’s Institution boarding school at the age of seven from his hometown Tapah. From the third floor of the school he learnt about the “boisterous mat salleh’s at the Ipoh Club on weekends”; how, feeling rich with 50 cents in his pocket, he could have the best rojak and cendol pulut and watch a game at Anderson Road padang or enjoy a wholesome murtabak at the Railway Goodshed near his school. He also reminisced on “cycling everywhere around town, eating the best ais kacang at Cowan Street, buying Beano and Dandy comics from small bookshops, afternoon dances at the YMCA,” and repeatedly mentioned the beautiful girls in Ipoh then. Undoubtedly the joy that he had experienced growing up in Ipoh has been etched in his memory permanently. Dr. Lim was however amazed that it took a foreigner, Ian Anderson, to come out with the book about ‘my home town’ a comment that drew a murmured acknowledgement from the 200-strong audience. Then again, Anderson has a passion for Ipoh. Many would remember that in 2006 Anderson held an exhibition at Museum Darul Ridzuan entitled, “The Story of Ipoh: From Feet to Flight” which traced the history of transportation from boats and sampans to gharries, automobiles and aeroplanes. That exhibition was reported to have attracted over 5,000 visitors. With his kind of passion, first an exhibition and now a book, Anderson certainly has earned the right to call Ipoh “My” hometown. Ipoh, My Home Town is available at MPH (Kinta City), S.S. Mubarak (Old Town), Ariff Store (Canning Garden) and online at: www.ipohworld.org. Next came the Orang Asli Village which is an absolute disgrace and not worth the journey. We are sure that at one time this was an untouched sanctuary where the people lived as they have for centuries. But today the village is spoilt by an ugly, government built, water treatment and distribution plant, right in the centre of the village consisting of bare steel girders with tanks on top. It could not be uglier if it tried. Now of course, providing clean water for the people is a noble and necessary thing to do, but when it is done with no thought for nature or the village environment then it becomes an eyesore. We implore the government to be more thoughtful of the environment in their future projects on the islands. The trek up to see the Rafflesia was wet, a little steep and suffered from a galaxy of friendly leeches who attached themselves to the ankles with gay abandon. The children screamed and cried, but nonetheless made it to the top to see their first Rafflesia, although not yet properly open. One smart trekker had brought the salt and the leeches were soon vanquished although the bleeding continued. Next time we shall wear Leech socks! Pulau Talikali was quite different. The walk was steep in places and there were plenty of signs of elephants, wild boar and others. Fortunately we did not meet face to face with any of them, but there was no doubt they were around and probably heard us coming. The view was breathless; as we were by the time we got to the viewpoint on the top. At this point you may be wondering why we did not actually visit the protected Royal Belum Forest and State Park, said to be the final frontier of our disappearing virgin rainforests. The answer is two fold. First we did not know what we were to find in the area and took this short trip as an introduction to future trips and secondly we had not allowed ourselves the three weeks that are often required to arrange a government permit to visit the park. But rest assured, we shall be back for a longer trip soon that will take in more of both Temenggor and the State Park, for there is so much to experience. Turning to more general aspects of our trip, we were very disappointed in a number of things. First, our joy at arriving at Pulau Banding Jetty soon turned to dismay when we saw that, despite the huge red sign that prohibited littering, there were polystyrene food packets, plastic bottles and paper covering the entire jetty area with Roti Canai curry sauce all over the seats. Nothing short of disgraceful and if we understand correctly the stall holder who sells these offending items is responsible to the government for the cleanliness then he is just not doing his job. From all accounts punitive government action is long overdue in this area. Secondly the solidly constructed boat jetty cannot be used as its designer did not taken into account the rise and fall of the water and apparently being designed for low water is completely submerged. We therefore boarded our boat over the muddy, litter-strewn bank. A standard floating jetty, in use all over the world is what the government should have spent our money on! Why didn’t they? Surely Perak must have someone with knowledge of such basic requirements. One wonders how the contractor qualified for the job. Then as we made our way around the lake over the next three days we were surprised to see how many islands are occupied by government departments, we believe as private recreational facilities. Add to these the small tour operators who provide campsites and floating chalets with doubtful control of effluent, litter and use of the lake and again, we worry for the future of the ecology of the area. Unless properly controlled, more people invariably means more pollution, degradation and destruction of nature’s gifts, all in the name of profit. Malaysia really needs to take a leaf out of Australia’s or New Zealand’s book as to how to control reservoir and forest activities without stifling tourism. But if the above is not bad enough the worst is yet to come. Logging! 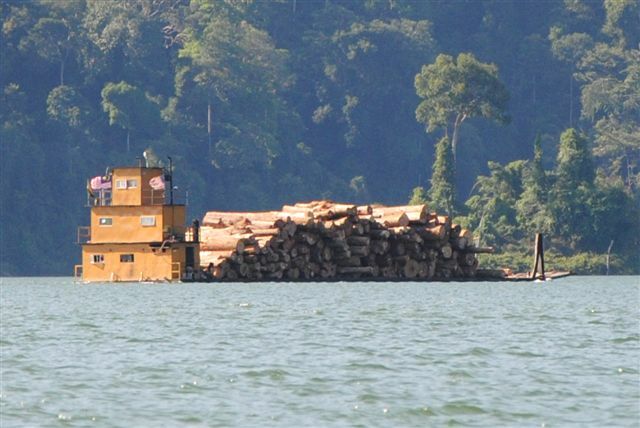 Yes this desecration of our ever diminishing rainforest continues unabated and as we understand it, perfectly legally, the evidence being in the barges on the lake and lorries that abound on the road, carting away the giant trees that Mother Nature took so many decades to grow. Of course there are promises that this will all stop soon, but there have been many earlier, empty, promises which have allowed the destruction to continue, changing the whole face of Malaysia by displacing people, destroying the ecosystems, driving animals into extinction and turning green lands into almost barren deserts. So what can we, who proudly call ourselves Perakians, do to stop all these problems? The answer is simple. First support the MNS and WWF as strength is in numbers and secondly, employ democracy. Let your government representatives know your feelings. We shall not be accused of sedition or being anti-government as long as we do this sensibly and within the law. Can you imagine the effect on your local Exco representative if he was to receive 50,000 individual letters from unhappy constituents? Surely he would act on your behalf or face the rest of his life regretting his inaction. Our failure to take action now will only result in more destruction. After promising ourselves for more than 12 months that we would visit Temenggor/Belum, we finally got around to confirming a booking just after Christmas and took off for the trip on 31st January. The following describes our experience. The first problem was where to stay as there are many tourism internet sites extolling the virtues of possible places – campsites, houseboats, floating chalets and more – but local advice was that there were only two places to be seriously considered if we wished to experience genuine attempts at ecotourism, the Belum Rainforest Resort on Banding Island or the Belum Eco Resort on Temenggor Discovery Island. A visit to each website made it abundantly clear that this would be an easy decision to make as they are as much alike as chalk and cheese. The Belum Rainforest Resort, owned by Tan Sri Mustapha Kamal’s Emkay Group, is almost exactly what you would expect from any good quality resort in Malaysia with nicely fitted, air conditioned, en suite, hotel rooms providing telephone, mini bar and the like, just a few steps away from Reception and the Dining Room. 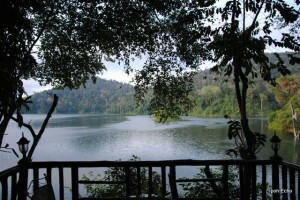 But we discovered that Banding Island is, in fact, not an island but part of the Temenggor mainland projecting into the lake and the resort is close to the main road, easily accessible by vehicle and well above the lake, thus allowing only glimpses of the water from most areas. Therefore you really do not get the feeling of being close to nature. To some extent this is combated by cladding the external concrete walls with bamboo, a landscaped garden of rare local herbs and fish ponds rearing rare and almost extinct fish for eventual release into the wild. 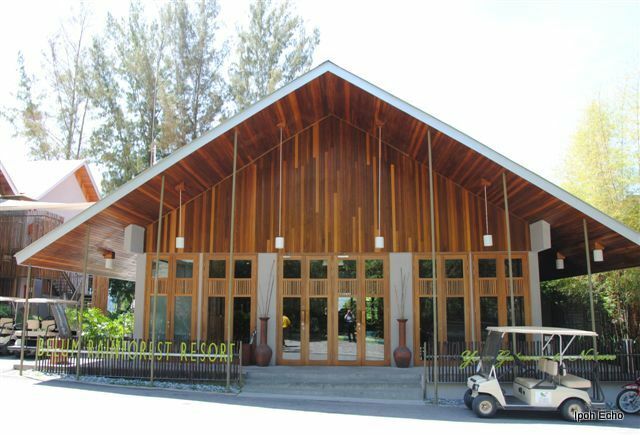 However the resort’s great advantage is their close relationship with both the Malaysian Nature Society (MNS) and the World Wildlife Fund (WWF), who provide eco-advice and the occasional lecture for visiting parties of young people. With trepidation we understand that additional chalets are planned as are development of homestead land parcels, a Rest and Recreation area and the establishment of two five-star boutique resorts north and south of Pulau Banding. Despite the resort’s good record of caring about the ecosystems so far, we wonder if all these developments are necessary or whether they will bring any good to the area (other than profit for the developer). Such “development” usually translates into “destruction” and we fear for the future of Pulau Banding. 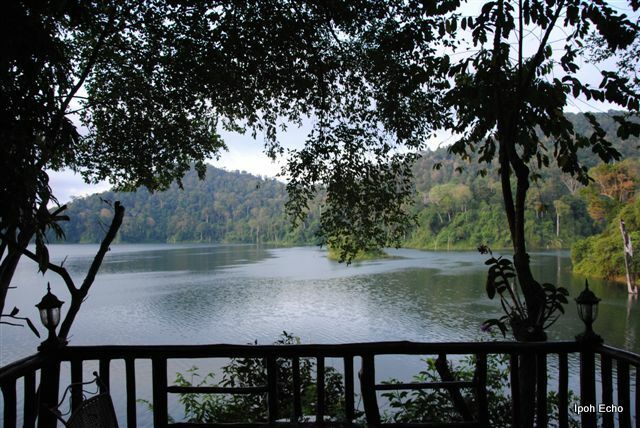 Rates at the Rainforest Resort range from RM350 to RM500++ for one twin/double room and breakfast for two. All other meals and excursions are at additional cost. Promotional rates may be available, but there is a surcharge during weekends, school holidays, eve and public holidays. 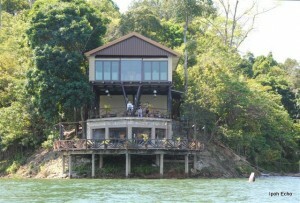 Totally different in every aspect is Belum Eco Resort on Discovery Island. First of all it is a real 6-acre island 7 km by boat from the Banding Island Jetty. Secondly, the accommodation has none of the luxuries of the Rainforest Resort – just small, twin-bedded, timber or bamboo chalets with atap roofs, each with a fan and an open-air balcony, the latter incorporating a shielded, but open to the elements, shower and wash hand basin. The toilets are in a spotlessly clean communal block just a few metres away, ensuring that all effluent is piped to an effective sewage treatment system rather than into the lake. Here you really are close to nature without any sign of civilization or pollution – you are in a world of your own and believe it or not it is mosquito-free! Additional facilities include an open sundeck below the breezy open air dining area, above which is a beautiful general purpose lounge where multi-media presentations about the lake and its wildlife are given. A shortcoming for the not-so-fit is that these general facilities and the chalets are a short walk from each other and require some 80 steps to be negotiated, 40 up and 40 down, to match the contours of the terrain. Being adventurous and really wanting to get a feel for the area we chose Discovery Island and booked their 3-day, 2-night package. It costs RM550 per person all inclusive. Pick up and drop off was at Banding Island jetty. We did not regret our decision for one moment. Discovery Island is owned and run by a father (Steve Khong) and son team who started several years by renting out houseboats on the lake and then moved on to the island on a longish lease. They have done everything they can to build the resort without spoiling the environment and have carefully constructed the buildings without cutting down trees or making them glaringly obvious to other users of the lake. All garbage is regularly removed from the island and many other eco-friendly practices are carried out. They have six young male staff, very capable in maintaining the resort, running the boats safely and providing tasty, quality local food whilst also fulfilling any special dietary arrangements necessary. Father and son eat with the guests thus maintaining the quality. Notwithstanding, it is fair to say that there are several improvements that could be made and Steve has some great plans for the future, finances allowing. Their 3-day, 2-night package, is based on the principle of free play in the mornings with swimming, canoeing and fishing available and short treks in the afternoons. Generously an unprogrammed extra was also thrown in FOC – a very memorable, early morning, boat trip to view the hornbills. Each day is rounded off, after dinner, with multimedia presentations on the locality and wildlife. The treks were reasonably easy although in part very steep, and on the first day they included Pulau Tujuh and its seven waterfalls, Kampung Chuweh, an Orang Asli Village on a separate island and Pulau Besar with its Rafflesia site. Day 2 took us on a short, (50 minutes) steep climb up to the viewing tower on Pulau Talikali. The view was well worth the climb. Our guide was reasonably knowledgeable about the flora and fauna but could only speak Malay which could be a setback, although it was no problem to us. Considering the treks in more detail, it seems that the Rainforest Resort also use Pulau Tujuh for their treks and camping and have built some permanent structures, toilets and pondoks. Our local guide was very careful to steer us around these and off the normal track and it was clear that he considers them as off-limits to us and not for use of anyone other than the Rainforest Resort. This seemed strange as the islands are government land that should be completely available to all. After all heritage and nature belong to everybody! How can one resort lay claim to public property at the expense of others? We do hope that this is not the old story of those rich in cash and contacts using their position to trample on others less well endowed as so often happens. That is certainly not the spirit of 1Malaysia! Should our government be spending large sums of money on something that will continue to be a drain on resources forever? Just over a month ago it became public knowledge that Perak’s only surviving tin mining bucket dredge was “in danger of flipping over”. In fact the problem is not new as it started a year ago and has become more severe as the months passed. The photograph taken from the rear of the structure, on November 28, 2009, shows how much it has gone over to one side. We would estimate it being 15 to 20 degrees. So what should be done and by who? That comes down to responsibility and, therefore, it is important to establish ownership. If we understand it correctly, the dredge was originally owned by Osborne and Chappel (Q&C). 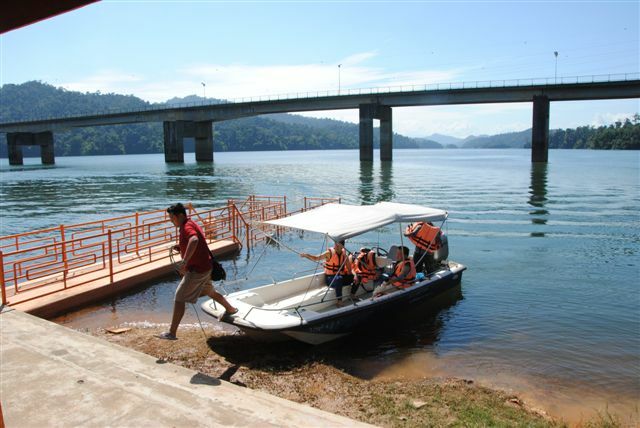 Rather than dismantling it and selling it, they took the public-spirited approach and, after spending a significant amount on preparing it for display as a tourist attraction, gave it – lock, stock and barrel – to the Perak State Government. The latter spent around half a million Ringgit on preparing the site, constructing buildings, roads and car parks and, after some delays, opened it as a tourist attraction on the January 1, 2008, under the management of O&C and at their cost – a fine example of government and private sector collaboration. So what has happened to the dredge? It meets the requirement of collaboration as defined above, yet it has been gradually sinking for more than 12 months! Just what went wrong and who is at fault? The recent statement by senior executive councillor, Dato’ Hamidah Osman, in an English daily, makes it clear that the State has “handed over” the dredge to Century Mission Sdn Bhd and they “should be responsible for maintenance and upkeep”. She also made the point that “repair costs could run into millions of Ringgit”. A company spokesman is also quoted, as saying that a proposal for repair of the dredge has been passed to the government, which indicates that the company believes the government still bears the responsibility. Should the state government be spending large sums of money on something that will continue to be a drain on resources? Make no mistake, an all-steel dredge, built 71 years ago, floating in water and subject to Malaysia’s humid climate can only deteriorate unless an adequate maintenance gang can be onsite every day to combat the decay. Take the Sydney Harbour Bridge and the Forth Bridge as examples, both have a permanent team of painters who, having painted from end to end, return to the beginning and start again. Maintaining the dredge will be a drain on government resources. But there are those who believe that the Kinta Valley should have a tourism attraction based on our tin mining heritage. However, despite all the nice words written about heritage and tourism in past issues of Ipoh Echo, no one, not our local philanthropists, old tin miners or towkays have come forward to set up the Kinta Valley heritage gallery of mining and pioneer miners, as been suggested (Ipoh Echo Issues 83 and 84). Nor have they, apart from Century Mission Sdn Bhd, put anything substantial into saving the dredge. Consequently, with no other tin mining heritage available to visit, the dredge does have major significance to our state and should draw tourists dollars to help pay for it, if it was properly maintained. The authors of this article strongly support saving heritage where practical, but the dredge with its major problems is not one of them, as the cost of maintenance and management will almost certainly outweigh any gains from tourism. We would, therefore, propose the following. Let Century Mission Sdn Bhd and the government save those pieces of the dredge still suitable for display, scrap the remainder and add the money gained to the amount that would have been spent over the next five years in maintaining this lost cause. Then use this fund to follow up on the statement made by Dato’ Seri DiRaja Tajol Rosli, in February 2006, to set up a new Kinta Valley Heritage Gallery managed, collaboratively, by the public and private sectors. This can have its own sections on tin mining and the pioneer miners and being centrally placed in Ipoh. No doubt some of the heritage enthusiasts will accuse us of heresy for wanting to scrap Perak’s last dredge. But to them we say “be realistic”. Despite all the headlines in the press nothing has been done to overcome the problems. Furthermore, a recent meeting of the Perak Heritage Society, called to discuss the dredge, was poorly attended and does not seem to have helped the situation at all. So in reality we believe the project is doomed to failure and fighting a losing battle never makes any sense. We look forward to his statement of intent. Ian Anderson is Director of Ipoh World and established its database and website: www.ipohworld.org.